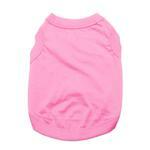 Our Barking Basics!® Dog Tank Shirt in Pink is the perfect shirt for almost any pet at an exceptional value! 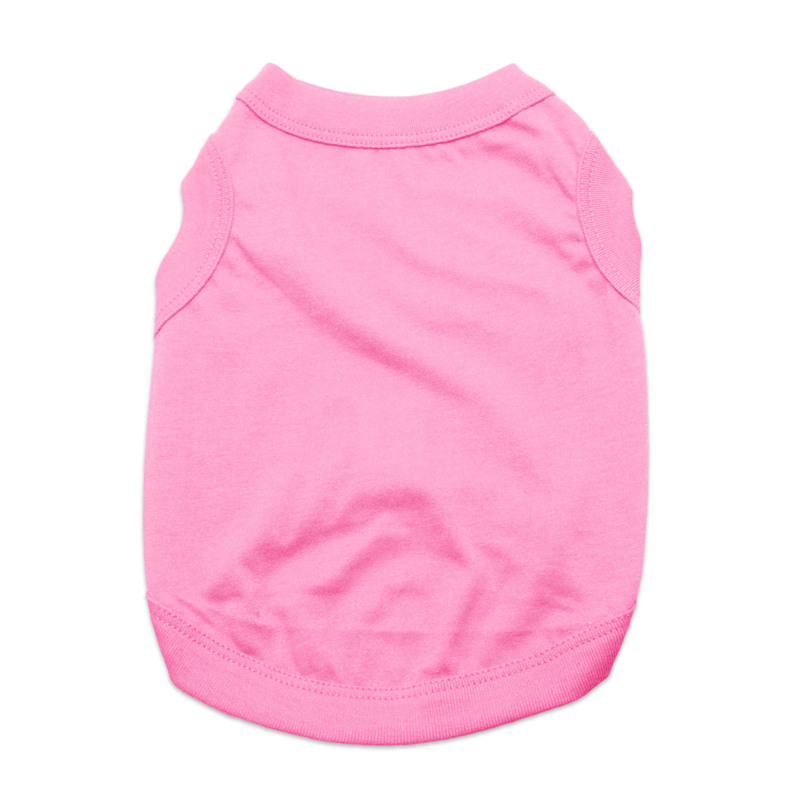 This Barking Basics!® Dog Tank Shirt in Pink is sure to be your dog's favorite with a comfortable fit and 100% cotton breathable knit. Great on its own or use this tank year round by layering it under coats and sweaters to help keep shedding down and for extra warmth. This carnation pink shirt is appropriate for Valentine's Day, girl-power events, and is a favorite shade for spring and summer. For even more fun, add iron-on patches, embroidery, or screen printing to commemorate an event or just for cuteness. Barking Basics Dog Tank Shirt - Pink Customer Photos - Send us your photo! Killer our 13 year old pug supports his mother in the pink t-shirt. Scarlet No Haira is a hairless Chihuahua. She is as sweet as she is cute!! ? Eloise loves it when I get out my camera to take her picture, she instantly poses! I bought her this shirt because the color looks amazing on her and it's comfy so she can wear it all day with out any discomfort! I've bought three of these tank tops and I think I'll keep collecting the colors! Two paws up! 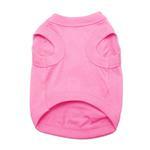 This is the second pink barking basic tank I've bought for Henry. He outgrew the first one and we liked it so.much and loved the color on him, we had to get one that fit. Thanks BB for carrying sizes for the BIG GUYS! Rizzo is sporting her pink basic tank from BaxterBoo, she is ready to spread the love on Valentine's Day! Bought for my hairless Chinese Crested. Cute color, high quality cotton. Liked so much bought 3 more! We love these Tees, can use them as a night shirts but def cute enough for everyday wear or layering! This shirt was purchased to match the floral tutu of my dog and it is ideal. The color is the shade we needed and it is lightweight and the right length to tuck in under her tutu. Posted On 08/05/18 by Paige B from Byram, MS Yes, Paige B recommends this product! This shirt is so cute. Purrfect for the summer. Posted On 04/08/18 by Bernedette A from , NY Yes, Bernedette A recommends this product! I bought this in a size 2X for my 85 pound doberman. She has many colors and gets excited when we pull a clean one out for her to put on. They are light weight and seem to fit her pretty well and she loves them. Nice material and love all the colors they come in! Bought these in a size larger for my dog to wear to bed. Hey, everyone needs something cute! Cool and comfortable if you like to dress your dog in the summer! Posted On 11/07/17 by Dolly's Mom from Orange, VA Yes, Dolly's Mom recommends this product! Bought this for my dog to sleep in. She loves them! Very well made. Dolly says they are also really comfy and make her sleep better. Cute casual T-shirt fits a little snug, went a size up! Posted On 08/19/17 by Denise N from , NY Yes, Denise N recommends this product! Lovely shade of pink. Looks fab against my min pin Zita's black coat. She is appx 8lbs and wears a medium perfect. Machine or hand wash and I drip dry. No issues, pilling or shrinkage. CAT LOVERS: please know I lent a few of these tees to a friend for her cat post op and they worked PURRRFECTLY. Posted On 06/12/17 by Jennifer L from Senoia, GA Yes, Jennifer L recommends this product! I'd love to have one in every color. Very comfy and great fit. Perfect by itself or paired with an accessory. Fits perfectly. Cute and simple. Can't have enough of these shirts for either dog. Fit is great. Posted On 05/08/17 by Valerie G from Mesa, AZ Yes, Valerie G recommends this product! This dog tank shirt is light and was described just as it stated on the website. I highly recommend these for those cool spring days. Posted On 05/01/17 by diane c from tucson, AZ Yes, diane c recommends this product! Great product but seems to run a little small. Posted On 04/19/17 by Penny from Miami, FL Yes, Penny recommends this product! It's a nice simple t-shirt, but you do need to order the next size up if you have a dog with a thick coat. Posted On 04/09/17 by Paige B from Terry, MS Yes, Paige B recommends this product! Perfect Basic tee to wear alone or with a cute pair of pants or shorts. My 50 pound Pitt/beagle mix is in between sizes. The xxL is way too big but the xL is too small, especially too snug in the front upper leg area. Ordered same colors in both sizes and the colors were a little diferent but was not really a big deal for me. This is a thin, basic tee as expected. You get what you pay for. Nothing special Just ok. Pretty color though. I love this Barking Basics Dog Tank Shirt on my Chinese Crested!!! It fits her perfectly and she seems very comfortable in it!!! I have every color for her!!! Posted On 03/14/17 by Rebecca Curry from Cameron, IL Yes, Rebecca Curry recommends this product! This pretty pink Tee fit my dog. Good service when ordering. I recommend this Tee. Posted On 03/04/17 by kendra C from , ID Yes, kendra C recommends this product! THIS ALSO FITS MY BRITISH BULLDOG ,ITS BEEN SOO HARD FINDING HIM STUFF I HONESTLY GAVE UP, THANK YOU BAXTER BOO!! Posted On 02/20/17 by Lauren P from Bronx , NY Yes, Lauren P recommends this product! For my french bulldog it fit him perfect a little long in length but it's nothing we can't take care of on our own. Posted On 02/03/17 by MARY L from Danville, VA Yes, MARY L recommends this product! It's absolutely beautiful on our little girl. Great shirt! perfect fit and looks great! Very light weight and comfortable. My Yorkie loves it. Such a pretty pink. Great price. Posted On 01/23/17 by Nancy B from Fultonville, NY Yes, Nancy B recommends this product! This tank shirt is made of very nice fabric. It fits well and is just asking to be bedazzled! The sizing is different than the stores so take my advise and measure your animal! Posted On 01/07/17 by Jennifer M from Tinley Park, IL Yes, Jennifer M recommends this product! Happy with quality and length of T-shirt. The only thing I would change is how the arm holes are cut. Instead of round, oval would fit better and not pull the T-shirt. She loves her T's. They fit and look super on her. Posted On 12/05/16 by Paige from Byram, MS Yes, Paige recommends this product! What more can I say...a girl's gotta' have a basic pink T-shirt! Posted On 11/07/16 by Donna D from , Yes, Donna D recommends this product! I loved this little shirt. Pretty color. I ordered a small and it was too small for my 14 lb. Shih Tzu so I would order up. The small was to small for my dog in that range. The opening was too small to consider putting it over her head. I purchased a Medium for another dog that fit her. The medium barely fit the one that I ordered that size for. The XL for the larger dog was about twice the size he is. I hope the Large will fit him. The size charts are not accurate. Posted On 10/21/16 by Dana R from Casper, WY Yes, Dana R recommends this product! Posted On 10/16/16 by Jane R from , Yes, Jane R recommends this product! Cute pink tee shirt, looks great on my little girl. Cute shirt. Looks and fits perfect. Posted On 08/23/16 by Brian O from Pembroke pines, FL Yes, Brian O recommends this product! At first I was cautious ordering for my boxer this shirt but after reading the reviews I went ahead and gave it a shot and I'm super happy I did it's a fitted shirt that fits her good and my dog wears it every night to sleep. Posted On 08/14/16 by Pearl T from , FL Yes, Pearl T recommends this product! Posted On 07/22/16 by Cheryll G from Shenandoah, IA Yes, Cheryll G recommends this product! Perfect for layering under Barking Basics hoodies! Posted On 07/21/16 by Karen K from , CA Yes, Karen K recommends this product! Thes Sweet Light Pink Tee...Pretty color to go on my cute girl! Although the style of this T-shirt is cute, and it comes in great colors,the material is relatively thin, and is very snug on my dog...I might go up a size if I was purchasing again. Posted On 06/02/16 by Peggy L from Palm Harbor, FL Yes, Peggy L recommends this product! Fit is true to size, I really like it. Super cute and simple. My girl looks good! Posted On 05/12/16 by Debbie B from Edwardsville, IL Yes, Debbie B recommends this product! These t-shirts are very well made and nice looking. And as usual, BaxterBoo gets them to me very quickly! No complaints from me! Posted On 04/29/16 by Crystal V from , CA Yes, Crystal V recommends this product! Pretty in Pink! Love this color it is perfect for my puppy! I bought two light pink for the house in summer when the air condition is on. it's just enough for her. Posted On 04/11/16 by Shelby S from Hertford, NC Yes, Shelby S recommends this product! Fits my English Bulldog Perfectly! Posted On 04/04/16 by Linda C from Fillmore , CA Yes, Linda C recommends this product! We rescued an English Bulldog with all kinds of skin conditions. She is the sweetest dog ever. She has no hair on her back from the ribs down. She loves to sit out in the sun and watch for lizards so that she can chase them. I am always worried about sun burns and pollen getting all over her back especially. It is very difficult to find clothes for Bulldogs because their neck and shoulders are so big, but this shirt fits her perfectly. My chiweenie absolutely loves these shirts! She is to adorable. They fit perfect! Posted On 03/22/16 by GLORIA V from Chatsworth, CA Yes, GLORIA V recommends this product! The colors are so vibrant and excellent quality!!! Good for keeping the chill off a small dog. Good prices. Liking the pink! Beautiful shade of pink - perfect fit! Posted On 02/23/16 by Gail from Pilot Mountain, NC Yes, Gail recommends this product! Fits my little girl perfectly. The material is soft and of excellent quality. Love the cut for the arms and bare belly feature that makes accidents on clothing a non-existent issue. Thanks Bax-Boo! Posted On 02/06/16 by Teresa W from Suffolk, VA Yes, Teresa W recommends this product! Posted On 01/12/16 by Mackenzie B from Vacaville, CA Yes, Mackenzie B recommends this product! Just like a basic tee for a human. Good price. Like how the leg holes are. Posted On 01/08/16 by Dawn S from Lorena, TX Yes, Dawn S recommends this product! This item was purchased for our miniature schnauzer who enjoys wearing these tanks. 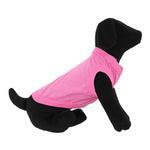 The tank is a very pretty light pink color which looks great on our black and white schnauzer. The product is soft and light weight which makes it great for wearing around the house. It keeps her from getting chilled and she does not get too hot having it on. I have been very satisfied with these tanks - so satisfied that I have purchased them in various colors for our two dogs. They wash and dry with no problems. I bought 4 for an older dog. She likes them. Good close fit to the body(for safety), lightweight, for inside in winter. Her hair is thinning and I clip it short . This will keep her from having body heat loss. Plus she looks good, and she knows it! Posted On 09/30/15 by Jennifer G from South Lyon, MI Yes, Jennifer G recommends this product! Love the item and can't beat the price - it was even on sale!! This shirt is so soft and is a very pretty shade of soft pink. It looks great on Suki! Posted On 09/13/15 by Sonia L from Los Angeles , CA Yes, Sonia L recommends this product! I bought this tank for my 11 pound miniature pinscher to wear and I love it! Size medium is perfect for her lengthwise . It's a great deal and she looks super cute in it! Recommend ! Posted On 08/17/15 by Jennifer M from Rogers, AR Yes, Jennifer M recommends this product! Love these tees!!! Had never tried them before. Started off ordering 3, and ordered 4 more the day they arrived! Great fit, beautiful lightweight fabric. Perfect! Her brother has the same one but in BLUE and it just looks so cute on them! The quality is good too! I haven't had any problems! Posted On 07/13/15 by Lacy J from denver, CO Yes, Lacy J recommends this product! had to go a bigger size for my german shepherds but my girls look great in these basic tees. I put puff paint on them and designed them for a race we ran and got tons of compliments!!!! the paint is still on them after a few races (rare that happens) and the quality is great. Still cool enough to breath in and move great with the dogs during the race. Posted On 06/17/15 by Mary S from Portland, OR Yes, Mary S recommends this product! My little guy is always cold even when it's 100 degrees with the A/C on! Just the right amount of warmth! Posted On 05/02/15 by Margo C from Belgrade, MT Yes, Margo C recommends this product! After following the directions on how to measure my dog for these t-shirts, the t-shirt fits perfectly! This is exactly what I wanted, too. Posted On 04/15/15 by Sarah from , VA Yes, Sarah recommends this product! Posted On 04/09/15 by Lynn W from Graham, WA Yes, Lynn W recommends this product! My little puppy looks so cute in this little shirt, she and I both love it. Posted On 03/30/15 by Eduardo Z from arleta, CA Yes, Eduardo Z recommends this product! I bought this shirt for my mom's chihuahua and she loves this shirt. She even starts jumping dancing when their going to put it on her. My mom loves the color and fabric and how it looks on her chihuahua. Will definitely be purchasing more in the future. Posted On 03/15/15 by Penny E from , IL Yes, Penny E recommends this product! Posted On 03/10/15 by Allison C from , Yes, Allison C recommends this product! Perfect for my little pup! Was perfect for my little Miss Penny looks great on her. Posted On 03/04/15 by Marilyn M from Little Rock, AR Yes, Marilyn M recommends this product! Cute as a button. A little big according to the size chart but will probably shrink a little in the dryer. Posted On 03/04/15 by Joy U from Lake Charles, LA Yes, Joy U recommends this product! I love these tank tops and so does my Helen girl. They are so light, soft and fit her so comfortably. I think she wants some more colors. They won't be too hot for our humid Louisiana summers. Wonderful product and great price. I love Baxter Boo. I don't even remember how I came across the website, but so glad I did. I could buy 1 of everything. Thank you! Posted On 03/04/15 by Linda B from Lively Grove, IL Yes, Linda B recommends this product! We share our lives with a Boston Terrier that has allergies. She wears clothes year round. I took advantage of this tshirt being on sale ($6) and stocked up. It's light weight, but covers her everywhere she needs it. I'll be buying more. Posted On 02/26/15 by Sarah O from Tyler, TX Yes, Sarah O recommends this product! These shirts are light but well made and run a little small so I size one up for my Shih Tzus. They fit great that way. They are good for undershirts in winter and in summer to wear alone under a harness.I just ordered 4 more I like them so much!